Our vessels are selected by the Australian Navy, NSW Waterways Authority, Search & Rescue Groups as well as professional and leading game fishermen. Our famous tri-hull designs have proven themselves over three decades in Australian waters. They are built strongly in fibreglass for serious work. 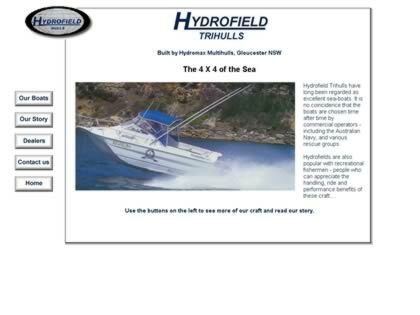 Web Site Snapshot: If available, above is a snapshot of the Hydrofield Multihulls web site at http://www.hydrofieldtrihulls.com/ as it appeared when this site was added to the directory or last verified. Please Note that Boat Design Net has no involvement with the above web site; all content and images depicted in the above thumbnail are the property and copyright of Hydrofield Multihulls unless otherwise noted on that site. Description: Our vessels are selected by the Australian Navy, NSW Waterways Authority, Search & Rescue Groups as well as professional and leading game fishermen. Our famous tri-hull designs have proven themselves over three decades in Australian waters. They are built strongly in fibreglass for serious work.